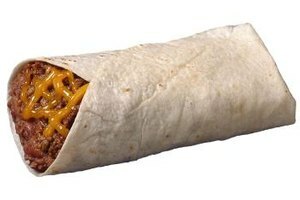 Bean and cheese burritos feed a family for very little cash. Whether you're cooking for one or for a family, preparing delicious meals on a budget is challenging. If you find yourself reaching for the same packets of ramen noodles or macaroni and cheese again and again, expand your mealtime repertoire with tasty, nutritious recipes you can prepare for under $20. Casseroles are a great way to use up leftovers and stretch staple ingredients into a meal. Canned cream of mushroom soup and shredded cheddar cheese turn a pound of hamburger and a bag of frozen tater tots or a can of tuna and a box of pasta into a family feast. A packet of dry dressing and dip mix adds a burst of flavor to any casserole. You can also make breakfast casseroles using oatmeal or any other hot cereal. Combine your favorite hot cereal with milk, butter, spices and eggs in a glass dish and bake up a hearty, inexpensive breakfast for the whole family. Whole grains and legumes offer a variety of possibilities for hearty meals under $20. Cook up a pot of black beans and brown rice for a complete protein; add chopped carrots and celery for an added serving of veggies. Leftover sausage, ham or bacon adds a lot of flavor to a pot of beans, and cornbread makes a thrifty, delicious side dish. Variations on beans and grains include quinoa chili, Southern-style baked beans with cheese grits or burritos served on multi-grain tortillas. Round out a meal by including an important daily serving of vegetables with a fresh lettuce salad with bottled creamy dressing for only a few cents per serving. Similar to casseroles in their simplicity, one-pot meals are great for stretching ingredients you already have on hand. Mix several half-boxes of pasta for homemade macaroni and cheese, and use cottage cheese or plain yogurt in the sauce to make shredded cheddar and mozzarella go farther. Add textured vegetable protein, often called TVP, to a pot of beef stew or chili and cut the amount of meat you'll need in half. Use a large can of tomato sauce as a base and add diced potatoes, canned or frozen veggies such as corn, carrots and peas and a dash of dry spicy ranch dressing and dip mix for a spicy homemade vegetable soup. Creating tasty, nutritious meals for under $20 is easier than ever with the advent of online and mobile phone coupons. If you have a smart phone, check your supermarket's website for downloadable coupons before you go grocery shopping. Buy in bulk whenever possible, and consider a farm share for inexpensive fresh vegetables. If you are single or have a small family, consider splitting the cost of a farm share with another family in your neighborhood. Small savings go a long way toward stretching your $20 food budget.